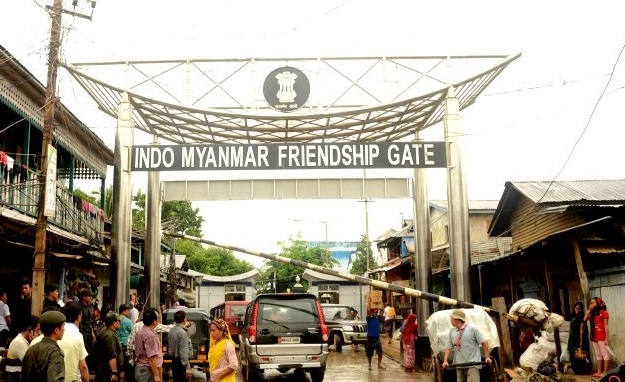 File picture of India Myanmar Friendship Gate. Manipur government has intensified security measures along the areas bordering Myanmar. Manipur Chief Minister Nongtham Biren Singh said the government will set up police station, check gate and deploy more security forces in those areas. He was speaking to reporters on the sidelines of a monthly meeting of leaders in Imphal from the hill areas of state on December 10. The Manipur government has taken the decision in order to check entry of illegal migrants and thwart unlawful activities in the wake of Rohingya crisis in Myanmar. Manipur Chief Minister N Biren Singh. The decision has come following a joint meeting of Chief Ministers of East and Northeast Indian states with the Union Home Minister Rajnath Singh in Kolkata few days back. The Manipur government will set up police station at Behiang area in Churachandpur district bordering Myanmar at the earliest. The Chief Minister has said that he is planning to visit the interior area to lay the foundation stone of the police station soon after the finalisation of other processes. The state government is also planning to deploy Indian Reserve Battalion personnel at Kwatha, another interior village in Chandel district bordering Myanmar. Apart from opening an additional police post, around 60 armed police personnel had been sent to Jiribam district. Jiribam is about 225 km from its state capital Imphal, bordering Assam’s Cachar district. The Chief Minister further said the authorities have directed the police in Jiribam to remain alert as illegal migrants might sneak into the state. The government is also considering proposal to construct a ‘Welcome Gate’ and open a police check post at Jessami village in Ukhrul district also bordering Myanmar. The government will also install a vehicle scanner machine at Khudengthabi post along the 110km Imphal-Moreh highway in Manipur which connects Myanmar towns with Indian towns.